If you have not read our review of the 1990 Mazda MX-5 Miata, do so Here. The reason is because we wanted to find a newer “econocar” for about the same price as the older Miata and see what a decade worth of newer technology would gain and to see which would be the better drive. 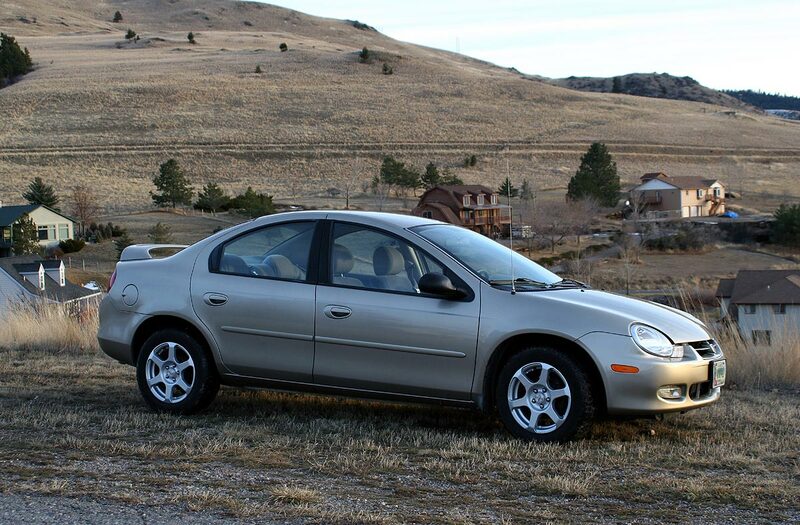 In our search to find a suitable car, the Dodge Neon came up as a candidate, as well as some others. The Neon started out in 1994 and was actually a very popular, and cheap, econocar through the 1990’s. At the tail end of the 90’s the car started to get long in the tooth and a new second generation car was released for the 2000 model year and continued until 2005. The Neons were known to have better than average handling for their price range and there were even some ACR versions setup just for the race track with a trick adjustable suspension from the factory. 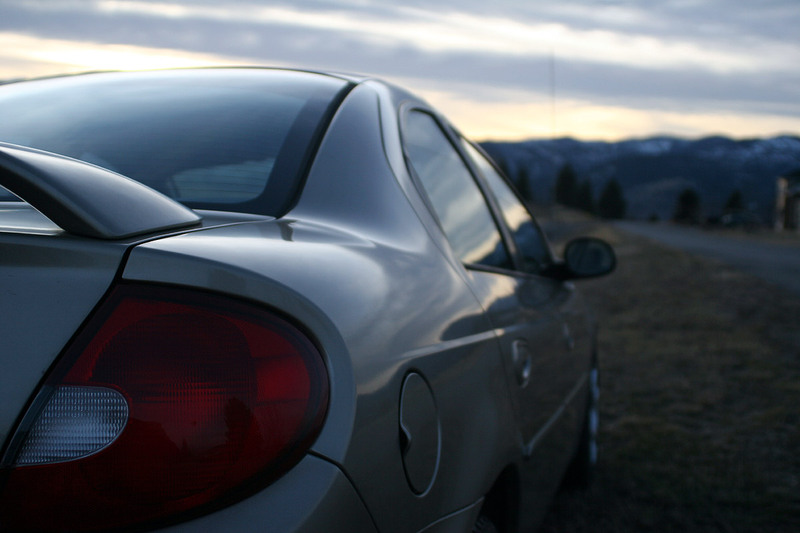 The SRT-4 was another notable version of the neon that included a 220hp (later 230hp) turbo charged 4-cylinder, and the SRT-4 is still a popular tuner or enthusiasts car today. Unlike the first generation Neon, the second gen was only available as a four door sedan which helped build the perception that the car had lost a bit of its fun to drive qualities and charm. The Neon that we were able to secure for testing here is actually a very low mileage car with only 35,000 miles on it at the time of our testing. The purchase price ended up being considerably higher than the Miata which was mainly due to the very low miles. 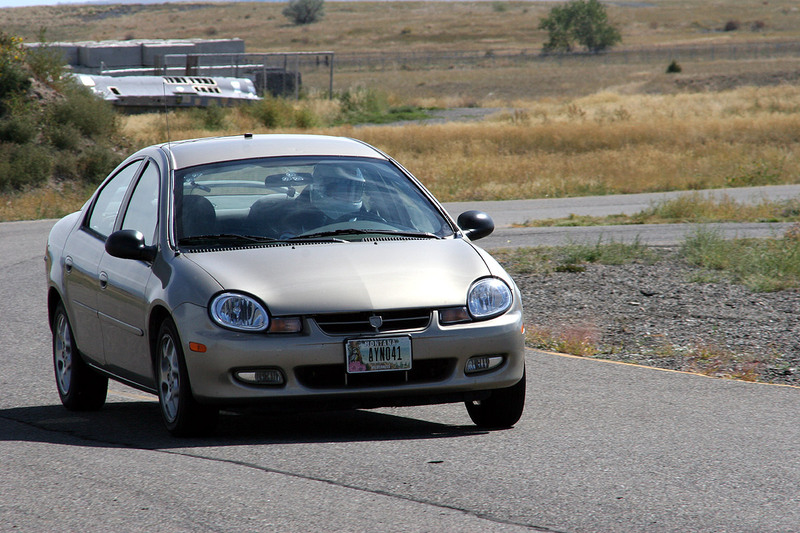 This 2002 Neon was purchased at $4000. Our test Neon was equipped with the SXT package, which, in all honestly, is all show and no go. The SXT package mainly included convenience features such as the rear spoiler, actual real alloy wheels (not hub caps), and some other packaged stuff. There were no other options on this Neon beyond the SXT package. The engine is a 1.4 liter SOHC 4-cyl with 132HP and as you might expect with so few miles, in excellent running order. The Neon is a good enough looking car and while it is not going to win any modern beauty pageants, they still look modern enough and are well enough equipped to make a good commuter car. The idea is find a fun to drive commuter car that is affordable to own, looks decent, and can bring a smile to the drivers face when he or she takes the long way home. 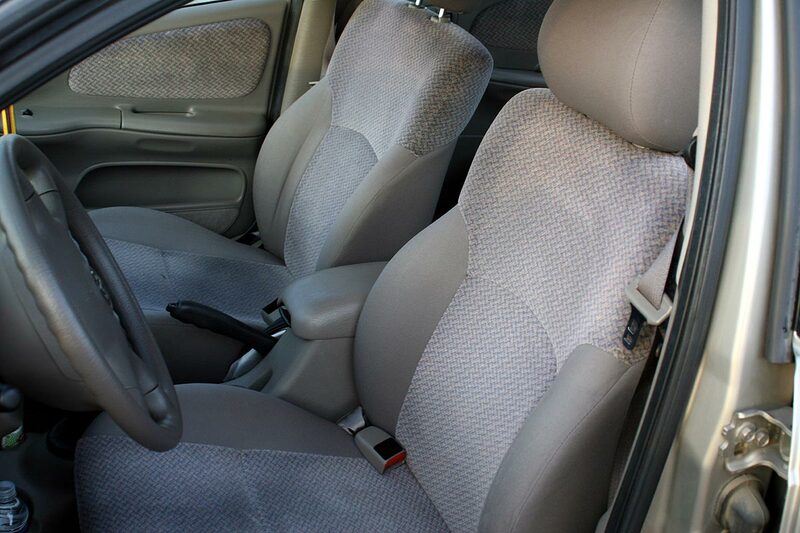 The seats are cloth and have some minor bolsters on the sides and they do an okay job of keeping the driver in place when hitting the turns hard. The interior itself is fairly plain with lots of plastic and there are just basic controls for heat, A/C, and other functions and they all work simple enough. The instrumentation are white faced and look pretty good and there is even a tachometer. With a new set of Bridgestone Potenza RE92 all season tires, fresh oil change, and some other routine maintenance, the car and the drivers were set to go give the Neon a test to see how it would do on its own as a driver’s car. At the same time we would be seeing how well it compared to an older drivers ‘hero’ car, a first generation Mazda Miata. The one thing that needs to be stressed and remembered is that this Neon is an econocar, built to be affordable to buy and operate. Sometimes we try to expect too much out of these cars, and in this case, the Neon acted a lot like an economy car should. Specifically, one of the good things about that is that the car did return over 40 MPG on the highway when driving it over to the test track, 115 miles away. We will admit that the Neon driver was a bit closer to the lead car than we normally like and it was certainly getting some drafting bonus for doing so. 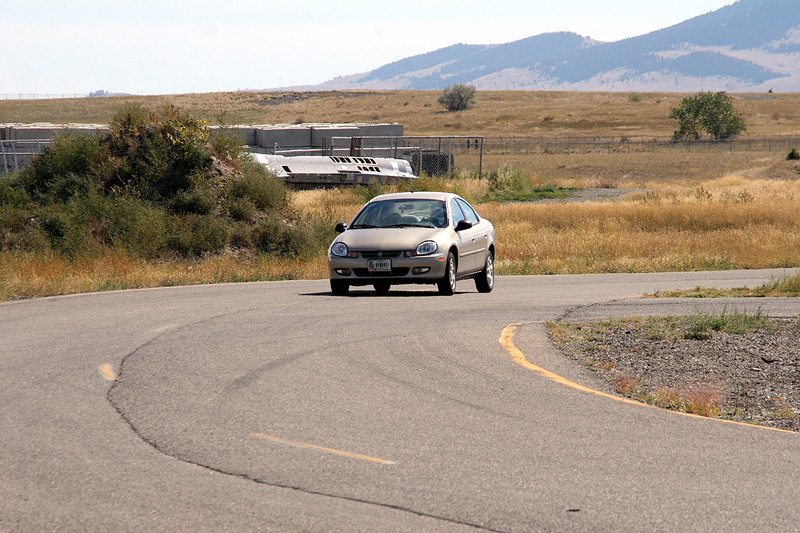 Normal highway mileage for this Neon is about 35-37 MPG at 75 mph cruising speeds. 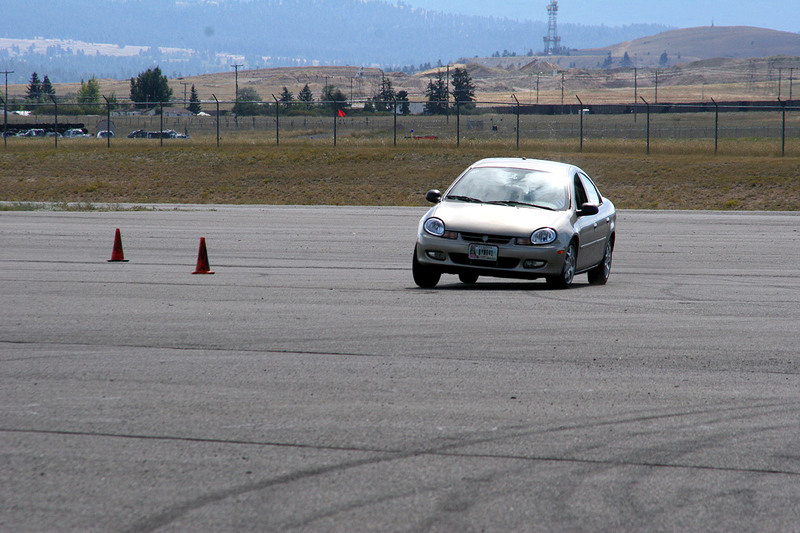 This was the first front wheel drive car that we have tested at the race track and all of the normal follies associated with a front wheel drive car were certainly present with the Neon. Anything handling wise ended up causing the car to display some fairly significant understeer, or “pushing” as car nuts like to call it. It certainly took some extra time on the track to figure out how to drive it for the best lap time but eventually a respectable time was achieved. Getting back to the fact that this is an economy car, the Bridgestone Potenza RE92 tires, while good tires, were made for cruising more than track days and when we started looking at some of the pictures around the skid pad, we were amazed the tires actually stayed on the rim as there was so much sidewall flex. The neon has a high level of body roll, as can also be seen in the pictures, and all of these things just continued to stack against the Neon and it was only able to pull .73 G on the 200 foot skidpad. The acceleration tests were conducted on our same non prepped quarter-mile stretch at the track that we always use for testing. With the weight transfer at launch pulling the front of the car up and with the limited traction available on a non sticky prepped launching area, the tires would spin a good amount before finally catching some traction to allow the car to get moving. The best 0-60 MPH time took 10.43 seconds, which while slow, was still a second and a half faster than the 1990 Miata. We always like to remind our readers that we do not abuse the poor cars on our acceleration tests and refrain from speed shifting, running them to redline, or similar abusive behavior. This Neon had remarkably low miles for the year of the car and so the engine was running fairly strong and it pulled all the way through its 17.97 quarter mile time at 79 MPH. By this point the Miata had closed the gap some and was only three quarters of a second behind the Neon, but that is still slower. The shifter on this manual transmission car is not overly exciting but it rowed through the gears just fine, just not with exacting precision. It was a little loose, but no shifts were missed during the day of testing and hard driving. 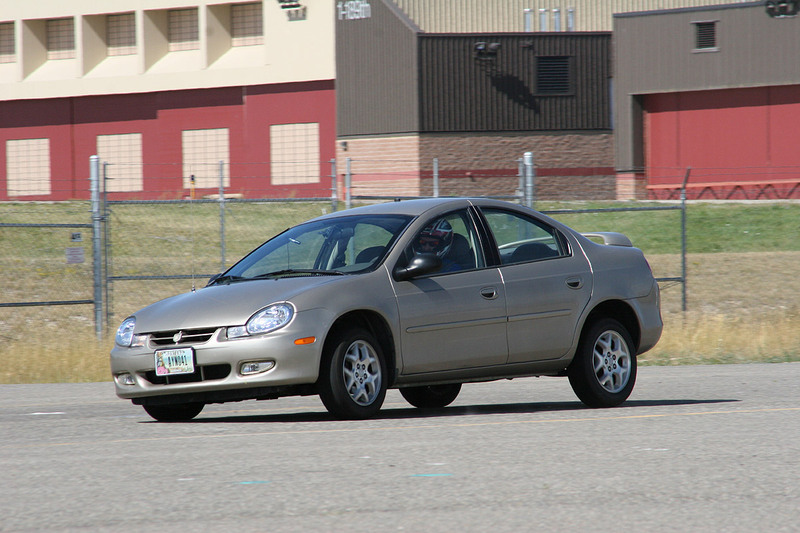 This SXT model of the Neon did not have the optional Anti-Lock Braking System (ABS) and so with its Disk Brakes in the front and drums in the rear, it really struggled, both with the brake test as well as around the road course, such as the braking zone going into turn 7. 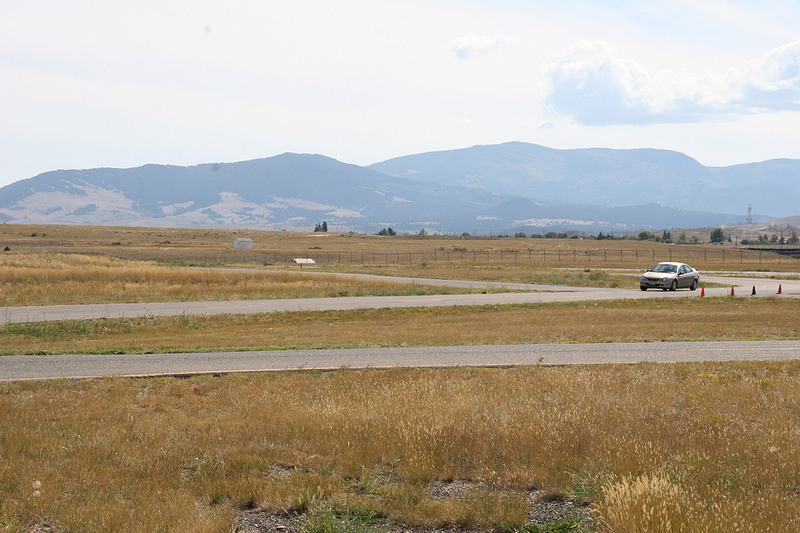 The distance to stop from 60 MPH was 171 feet, two worse than the Miata and like the Miata, a lot of that distance was wasted trying to keep the tires from locking up. The brakes did hold up during lapping and aside from the occasional lock up, they did the job. Unfortunately the brake feel was not great and due to this lack of feel it was hard to determine when the brakes were going to lock up or how much grip the tires still had. Around the road course and when on twisty roads, the steering is light and there is not a lot of feedback making road conditions difficult to feel through the wheel and it pretty much drove like a front wheel drive car with lots of pushing when attacking corners. In order to get any decent times out of the car it needed to be manhandled, keeping on the throttle to try and power and pull the car through the turns. Once this different driving style was understood, the lap times started dropping. The little Neon actually pulled fairly hard all the way down the straights and using a little trail braking to setup for the turns and then stomping on the throttle to pull the car through, it handled the turns decently enough. But with all the body roll and effort it took to get the car to perform, we almost forgot to have fun. It is here that the biggest difference is noticed between the Neon and Miata. The Neon actually put down a faster lap time than the Miata by a second and a half, it just took a lot of work to get there and it was not nearly as fun as the little Miata was, and is, to drive around a race track or on a nice mountain road. There was an ACR version of the Neon available on both the first generation and second generation cars and we have driven a 2001 ACR Neon and with its super firm suspension it was a whole different feel than this base model SXT. The ACR has an adjustable suspension and for a front wheel drive car it had remarkably neutral balance and it would certainly be the Neon to have for any sort of track driving, but they are very rare and hard to find, especially ones that have not been abused. The original first generation Neons (1994-1999) were also focused a bit more on lively driving and are considered by many to be more entertaining to drive as well. But we had neither an ACR (first or second generation) nor a first generation car for this comparison, but rather a 2002 SXT, and it was just not nearly the drivers car that the first generation Mazda Miata is. Sure, it did fair enough around the track and it put down a respectable time versus the Miata or other econocar competition, it just isn’t very fun doing it. Then again, we doubt other econocars are very fun on the track either. Guess we’ll have to find out!